These days, everybody needs a high-quality headshot. You definitely want one for your LinkedIn profile—our data shows that having a photo makes your profile 14 times more likely to be viewed. You probably use other social networks and services that can accommodate a profile photo, too – from Facebook to Twitter to Slack. This seems like obvious advice, and yet the web is full of “worst LinkedIn profile photos ever” articles. Here’s some advice to keep yourself out of these unfortunate compilations. Soft, natural light is best. To avoid harsh, unflattering shadows, don’t shoot a headshot in bright sunlight or using a camera’s built-in flash. Indoors, avoid shooting under fluorescent lighting to avoid a green color cast. You can often get great results by shooting outdoors and in the shade. Window light can also work very well, at least when sunlight isn’t streaming through the window: pose with a window to your left or right. Profile photos tend to be small, and if your headshot is a full-length, head-to-toe portrait, it’ll be hard to see what you actually look like. A head-and-shoulders portrait generally makes a better headshot. With some camera lenses, particularly those on a smartphone, getting physically close to your subject can introduce distortion—making someone’s nose look too big, for example. To avoid this, put some distance between the camera and the subject, and then zoom in or, with an interchangeable-lens camera, use a moderate telephoto lens. With a smartphone, use the standard pinch gesture to zoom in. But don’t zoom too far, lest you introduce digital distortion. Keep the background simple to make you the focal point. A sheet of white or black foam board works well. If you’ll be shooting a lot of headshots, consider investing in a set of stands and some rolls of background paper. I picked up a set of stands on Amazon for $35. If you don’t have the luxury of creating your own background, just look for a relatively uncluttered one. If you’re shooting using a digital SLR or other high-end camera, you can blur the background – in photography parlance, create a shallow depth of field – by using a large aperture setting. The portrait mode in the iPhone 7 Plus works beautifully for this, too. No sweats or heavy metal t-shirts, please. And that holiday party shot of you in formalwear? Unless you’re a casino greeter, it will not make an effective headshot. Dress like you might for a job interview, or at least a business dinner. (Carefully) consider a prop. A carefully chosen prop can help reinforce your professional role. In my headshot, which was taken by my colleague Lucas Deming, I’m holding a camera—appropriate for my role as someone who helps plan photography courses at LinkedIn Learning. But tread this ground carefully so as not to descend into the hoaky. A musician with her guitar? That could work. A chef holding a mixing spoon? Probably going too far. For more advice on effective headshots, see this article that we published a couple of years ago. 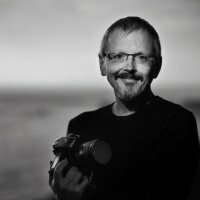 You’ll also find some expert guidance in a new LinkedIn Learning course, Learning Natural Light Portrait Photography, with photographer Chris Orwig. Are you looking to attend the Adobe MAX conference in October? Then you are in luck: use our discount code 17LKNDP today and save on your registration! For those who are attending Adobe MAX already, LinkedIn Learning will be taking free headshots in the exhibit hall – be sure to check us out!